Kevlar is the registered trademark for a para-aramid synthetic fiber, related to other aramids such as Nomex and Technora. Developed by Stephanie Kwolek at DuPont in 1965, this high-strength material was first commercially used in the early 1970s as a replacement for steel in racing tires. Typically it is spun into ropes or fabric sheets that can be used as such or as an ingredient in composite material components. Currently, Kevlar has many applications, ranging from bicycle tires and racing sails to body armor, because of its high tensile strength-to-weight ratio; by this measure it is 5 times stronger than steel. It is also used to make modern drumheads that withstand high impact. When used as a woven material, it is suitable for mooring lines and other underwater applications. 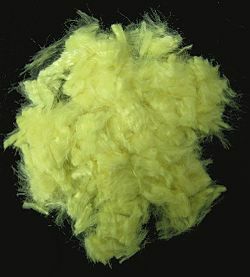 A similar fiber called Twaron with roughly the same chemical structure was developed by Akzo in the 1970s; commercial production started in 1986, and Twaron is now manufactured by Teijin. The solution was "cloudy, opalescent upon being stirred, and of low viscosity" and usually was thrown away. However, Kwolek persuaded the technician, Charles Smullen, who ran the "spinneret", to test her solution, and was amazed to find that the fiber did not break, unlike nylon. Her supervisor and her laboratory director understood the significance of her accidental discovery and a new field of polymer chemistry quickly arose. By 1971, modern Kevlar was introduced. 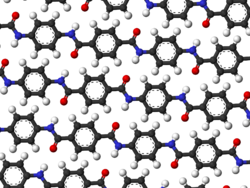 However, Kwolek was not very involved in developing the applications of Kevlar.